Personnel safety nets are a passive type of fall protection designed to catch a worker after they have fallen to help prevent contact with the surface below and prevent injury. Safety nets are erected around an elevated work area in such a way that if a worker falls from that work area, they will be caught in the net. Workers often sustain injury since they can legally fall up to 30 feet before hitting the net. Safety nets should only be used when the use of fall prevention such as guardrails and hole covers, which will not allow a worker to fall in the first place, have been deemed infeasible. Safety nets are designed to catch a falling worker to prevent injury to that worker. It is an example of passive fall protection, meaning they provide protection to workers without any active or conscious effort on their part. In contrast, active fall protection systems, such as personal fall arrest systems, require constant awareness and active participation of the worker to make sure the fall system will provide sufficient protection. Safety nets are typically used during steel erection, bridgework, demolition, and maintenance work. Safety nets are an acceptable means of fall protection for holes, open-sided floors, catch platforms and steel/concrete erection. They are often used where large open areas or long leading edges expose workers to high fall hazards. Nets can be used as fall protection on the exterior and interior of buildings under construction. Nets must be installed as close as possible under the walking/working surface, but in no case will an employee be exposed to a fall greater than 30 feet into a net. They must be installed in a manner that should an individual fall, they will not strike any object below the net. Safety nets must be inspected at least once a week for wear, damage and any deterioration. 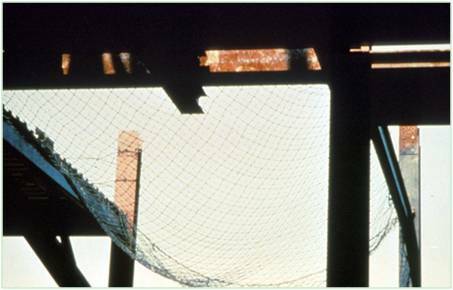 Nets must be inspected after any occurrence which could affect its integrity, such as a steel member falling into the net. Defective safety nets will not be used. Any materials, scrap, tools or equipment that falls into the net must be removed as soon as possible but no later than the end of the work shift. The installation of safety nets must be done by individuals protected from the fall hazards they are exposed to during the installation. Each net must have a border rope for webbing with a minimum breaking strength of 5,000 pounds. The maximum size of each safety net mesh opening shall not exceed 36 square inches nor be longer than 6 inches on any side, and the opening, measured center-to-center of mesh ropes or webbing, shall not be longer than 6 inches. All mesh crossings shall be secured to prevent enlargement of the mesh opening. Nets shall be installed in accordance with the net manufacturer's specifications and instruction. Nets shall be installed as close under the working level as practical, but not lower than 30 feet. They shall be hung with sufficient clearance to prevent contact with the surface of structures below when the user's impact load testing is applied. There shall be no intervening members between the working surface and the net that could be impacted during a fall. Safety nets should extend a minimum of 8 feet out for nets positioned at the same level as the work, and up to 5 feet below the work surface. Use nets with a 10 foot minimum extension width for nets positioned at 5 to 10 feet below the work surface. Use nets with a 13 foot minimum extension width for nets positioned at 10 to 30 feet below the work surface. Remember, under no circumstances should safety nets be used 30 feet or more below the work surface. Safety nets must be inspected at least once a week for wear, damage, and other deterioration. Nets should be inspected after any occurrence which could affect the integrity of the safety net system. Defective nets shall not be used and defective components must be removed from service. Materials, scrap pieces, equipment, and tools which have fallen into the safety net must be removed as soon as possible from the net and at least before the next work shift. Safety nets must be drop-tested at the jobsite after initial installation and before being used as a fall protection system, whenever relocated, after major repair, and at 6-month intervals if left in one place. The drop-test consists of a 400 pound bag of sand 30 +/- 2 inches in diameter dropped into the net from the highest walking/working surface at which employees are exposed to fall hazards, but not from less than 42 inches. 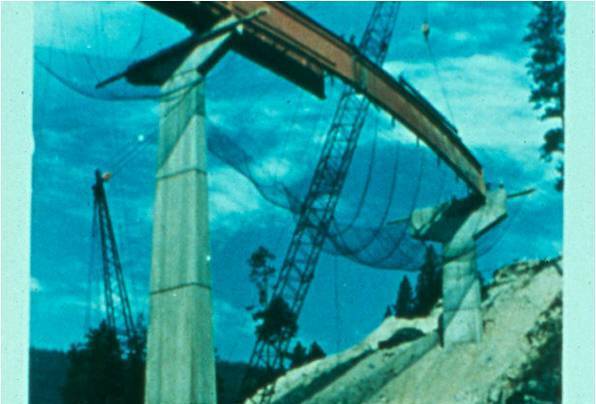 A tag line of sufficient strength shall be attached to the test weight to prevent it from falling to the surface below should it penetrate the net. The American National Standards Institute (ANSI) has published consensus standards related to safety requirements for the selection, installation, and use of safety nets during construction, repair, and demolition operations. This document is titled "ANSI A10.11 Safety Requirements for Personnel and Debris Nets" and has been revised in 2010. ANSI voluntary consensus standards are an excellent source of reference material and are widely recognized in industry. Working near an unprotected or leading edge can expose workers to potential fall hazards when there is no fall protection method in place. Falls from elevated heights typically result in severe injuries or death. A safety net system is a passive type of fall prevention designed to "catch" a person after he or she has fallen to minimize the potential of them hitting the ground. The risk of injury from falling to a lower level is reduced by using safety nets which are designed to break a fallen workers fall by catching them in a net. An increase in production may occur when workers, particularly those working at height, feel safe in the knowledge that they are protected from injury or death that may occur from falling from the work area. By using fall protection methods such as safety nets, production may increase because workers have a peace of mind knowing that the safety net is there to catch them and spare them injury in the case of a fall. The installation of nets requires careful planning. Workers who are involved in installing and removing safety nets must be protected from fall hazards by aerial lifts, personal fall arrest equipment, or a personal restraint system. Nets and/or horizontal lifelines can provide many solutions to fall hazards if they are planned, installed, and used.